Has your oppositional, defiant child’s behavior escalated to the point where he’s using physical force against you—or do you fear that he might? Kim Abraham and Marney Studaker-Cordner have worked with parents of kids with Oppositional Defiant Disorder for 20 years—and Kim is the parent of an adult child with ODD. 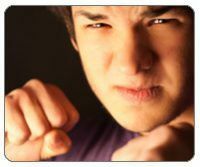 In this article, they explain how to handle your ODD child’s aggressive, violent behavior effectively. We’ve heard this from many parents of Oppositional Defiant teens and pre–teens, parents who are not only worried about their child’s current behavior, but about what could happen if things continue to escalate. If your child is already engaging in behaviors you never expected (lying, yelling at you, breaking the rules of the house, being destructive), it’s understandable that you would worry about aggression. What’s to keep him or her from crossing that line? We all have skills we use to cope when things don’t go our way: a “toolbox,” if you will. You can probably think of a few “tools” that you use when you’re stressed or frustrated. If you’re upset with your spouse, you may call a friend to vent. If your work is stressful, you may exercise or read a book when you get home to try to relax. Over the years, the make–up of your toolbox has probably changed as you’ve learned and matured. You may want to slug your offensive boss, but instead you use a different skill—one that won’t get you fired or land you in jail! Kids start out with an empty toolbox. They begin to fill that box as they encounter different situations—and parents, teachers and other kids model tools (or coping skills) that your child may try out and decide whether or not to keep. For instance, screwdrivers may not work for your child – he may need a pair of pliers instead. So venting might not help him feel better; listening to music may be more helpful for your 15 year old. Kids with Oppositional Defiant Disorder, ADHD, anxiety and other emotional challenges have a very difficult time finding and keeping tools in their box. They get frustrated more easily than your “typical” child, and often can’t see a way to resolve conflict without aggression. The only tool they often have is a hammer! Why Does He Use a Hammer to Swat a Fly? ODD kids have a very difficult time coping with stress or conflicts, even small ones. It may seem like your child is overreacting to something that you view as a pretty minor event. Kids with emotional challenges often feel powerless; they make up for this with aggressive words and behaviors. The thing is, this behavior typically backfires and your child ends up feeling even worse in the long run. By helping him learn to resolve things calmly, you will actually empower him. It can be hard to look past the words, threats and aggressive body language to what’s underneath. Oftentimes, ODD kids are not trying to be malicious—they simply don’t know what else to do. When your child was two, if he threw himself on the floor kicking and screaming, you could just carry (or drag) him out of the store. You were able to exert physical control. But over the years, tantrums can escalate if your child doesn’t learn other skills. By the time he’s a teenager, there’s no way you can pick him up. And now, you may be afraid he’s the one who’s going to take physical control of the situation. Understand this: Conflict is a natural part of life. It’s going happen. And it happens frequently between parents and children, because kids want what they want, exactly when they want it, and parents often have to set limits or say the dreaded word “no.” Conflict is also born simply from different personalities and outlooks: you see it one way, your child sees it another way, and so an argument is born. There’s a difference between conflict and arguing. Even though it’s difficult for most of us, conflict can also lead to growth: you want something, I want something different, what skills can we both use to resolve this? Arguing, on the other hand, is usually about winning. Your child can become so focused on “winning” the power struggle that the point of the conflict is completely lost. And let’s be honest – sometimes, as parents, we fall into the same trap! It can start to feel like a chess game, where you’re trying to out–maneuver each other. Other times, it may seem like a boxing match. But remember, it’s more like the “Marathon of Life.” You and your child are both on the same team, after all—and it’s more about teaching him appropriate skills than it is about winning. As parents, the very best we can hope to do is teach our kids about real life. In real life, there are all sorts of stressors: mean co–workers, disappointing jobs, (or sometimes no job), frustrating conversations, long lines in stores and rude people who cut in front of you. These are situations in which aggression will not only fail to solve the problem, it will make it worse. Your job as a parent is to show your child how a screwdriver can work better than a hammer. You can do this by modeling coping and conflict resolution skills for our child. One way to help your child get through tough situations is to remember that while he’s upset, there’s a lot of adrenaline pumping through him. Though we take it for granted, it takes a lot of coping skills to manage that physical burst of energy experienced whenever we feel frustrated or angry. If your child doesn’t have those coping skills yet, how is he going to release that energy? Without a positive outlet, he may resort to punching walls, destroying property or even coming at you—or someone else—aggressively. Even though the thought of calling the police on your child can be very, very difficult and is probably the last thing you ever thought you might have to do as a parent, if your child becomes aggressive toward you, it is very important to follow through and call the police. If you don’t, your child won’t learn that domestic violence is not only unacceptable, it’s against the law. And he may have to learn that lesson in a much more difficult way down the road—with a spouse or someone else who won’t hesitate to call the police on him. Remember, as James Lehman says in The Total Transformation, “There’s no excuse for abuse,” –not even from your child. During a calm moment, offer to work with your child to come up with a plan that you can put into effect if things start to escalate. Explain to your child how anger and adrenaline work, and develop a list of things he can do that are positive or acceptable to everyone when he’s feeling that way. Some ideas are exercise (sit ups and push–ups to get rid of adrenaline), going for a walk, going to his room and listening to music, or giving him a journal he can draw or write in. Think about his strengths – things he’s good at or enjoys. Ask your child what ideas he has, or he may even want to get suggestions from friends. This helps get him thinking, rather than reacting. Remember, you’re modeling for him how to recognize his own emotions and find ways to deal with them non–violently. Follow through and let him use those skills when you’re in a conflict with him. A power struggle is often a trigger to physical aggression, and if you can de–escalate the situation before it hits that point, it’s well worth it. Sometimes it’s so exhausting to raise an Oppositional Defiant child to adulthood. As parents we reach into our toolboxes and pull out coping skills that aren’t always effective. Ever find yourself arguing, yelling or blaming your child during a time of conflict? If so, it’s a good clue that you need to take a personal time out. In doing so, you’re showing your child it’s okay for him to do that, as well. Remember, you want to model an approach of “we can resolve this, calmly,” rather than trying to “win” or get the upper hand. You can actually tell your child, “When you get upset, it’s okay to turn around and walk away. I’ll know that means you need a break because you’re getting too upset. We can come back to the discussion later, when things are calmer. And I’ll respect that. If I get upset, I’m going to do the same thing.” This is a technique your child can carry over into other real-life situations as well. Your child may continue to follow you around the house, trying to carry on the argument, when you’re trying to disengage. If you have to (and he’s old enough), leave the house completely. Go for a drive or a walk. This will also help de–escalate the situation. Just because you choose to walk away to de-escalate a situation or allow your child to calm down, does not mean you won’t hold him accountable for his behavior, provide consequences if he doesn’t follow your house rules, or that you are “giving in.” Remember, it’s not about winning: it’s about teaching skills. So if you’re in a conflict with your child about him going to a friend’s house and you see that his face is turning red, you know the signs that he’s about to blow. You can end the power struggle by walking away. He knows the answer; it’s “no.” If he chooses to leave without permission because you’ve walked away from the argument, he probably would have left anyway. You can still hold him accountable when he comes home by providing a consequence—and you will have avoided a physical confrontation. It can help to think of the situations you’re encountering with your child now, and for the next few years, as opportunities rather than problems. It’s human nature to experience anger and adrenaline when in conflict. The important thing is how you handle it. When your child is in this mode, especially between the ages of 12 and 18, it’s a chance to prepare him to deal with the real world and real life for many years to come. No one wants to enter adulthood with an empty toolbox, not even your Oppositional Defiant child—and at the end of the day, he really needs you to teach him those skills he’ll need as he matures into an adult.